Mix all ingredients except chicken in a large bowl. Cut chicken into bite size pieces. Place the chicken into the liquid mixture and marinate for at least 30 minutes. 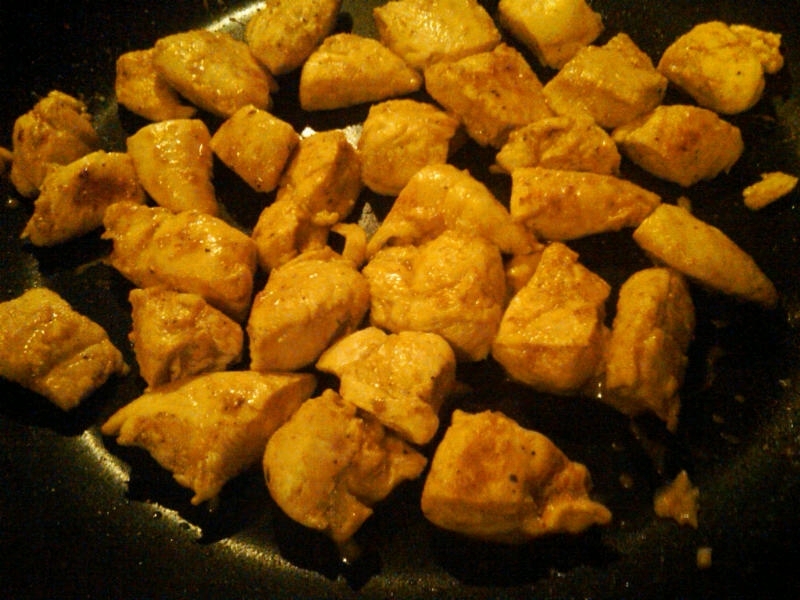 Place chicken in a pan over medium heat. Pour enough liquid to cover the bottom of the pan. Let chicken simmer for about 5 minutes then flip chicken pieces and repeat on the other side. After the liquid has evaporated brown the chicken pieces a little on each side and cook until chicken is cooked through. This recipe is absolutely delicious! Thank you! I have been doing SCD for just over 3 years and, because I haven’t been able to advance very far through the “stages,” I was getting a little tired of the same ol’ same ol’. Your website helps tremendously. This recipe earned high marks even with nonSCD’ers. This week I’ll be trying the apple basil chicken! This recipe is especially good if you add fresh peas, chopped cauliflower, and/or french green beans to the cooking phase. They don’t need to marinate beforehand.